This weeks Small Business Spotlight is on Military Standards Window Cleaning, located in New Port Richey, Florida! Scott Pearce, owner, served in the US Army for 21 years and has taken the ethics and standards he learned while in the Army to his window cleaning business. This family run company believes that no job should be done unless it is done to the highest standard. 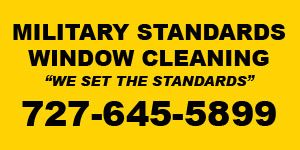 To learn more about Military Standards Window Cleaning, call 727.645.5899. We are a licensed and insured residential and commercial window cleaning company. Our services include interior and exterior window cleaning, screen repairs, gutter cleaning, and pressure washing. We offer free estimates and recommended schedule of cleaning. You may contact our office at 727-645-5899 to schedule a free estimate or inquire about our services. The most exciting part of our business is the standards that we set for the work that is preformed. We take great pride in providing our customers with above and beyond expectations. We want the final product to speak for itself; We set the standards! We use direct phone contact or person to person interaction. We think that our customers are number one and treat as such. Our biggest obstacles at this time would be the struggling economy. We know, just like everyone out there, how difficult the times are right now. As a new business, we feel for our customers and work around their struggles to make them happy as well as continuing to run a successful business. Scott has served our country for 21 years in the Army, and our name, as well as our standards of work, come from the central ethics he was taught while serving. The standards are set high and can be easily achieved by Scott. He takes great pride in his work and believes that no job should be done unless done to the highest level of standards. We are in a fantastic business networking group called BNI. Along with the many other small business owners, we work as one big team to get the word out about each other business. We first started our company with a stack of flyers and Scott and our son would spend the day going door to door. This is a family run business and we play a part in how we run as a team. We are starting to look into creating a Facebook and Twitter page. The new social media sites can be intimidating, but we are looking forward to branching out. We haven't had a whole lot of success with technology benefiting our business because a huge amount of the work we get is from word of mouth. We are really working towards increasing our name out in the world of technology. Our goal for the next 5 years is to get our business with in a financial capability to franchise our business. Within ten years I would like to re-retire my husband Scott because he so deserves it! We would like to offer a 10% discount on their initial interior and exterior window cleaning to anyone who mentions that they say our ad with ACF consulting. Remember this, we are more then windex and paper towels, we are more than just a man with a bucket, we are a window CLEANER! We take pride in what we provide, WE SET THE STANDARD, MILITARY STANDARDS!